Abdominal strains can happen with sudden twisting motions, hyperextension or for someone with a weak core. Your abs work to support your body when you walk around, keep up your posture while sitting, stabilize you when you bend down and even when you cough or laugh. A strained abdominal may hurt as you do basic motions such as walking or turning your body. If you have strained your abs, it is important to limit motion and wear a brace around your abs and back to help support your body. This will help minimize the amount of work your abs need to do. Our line of abdominal supports provide compression and support for strained abs as you heal. 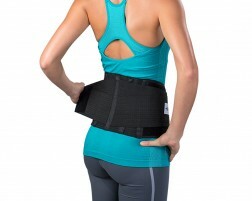 Need help selecting an abdominal brace? Use Brace Advisor, our guided tool, for recommendations based on your injury, injury prevention and activity level.